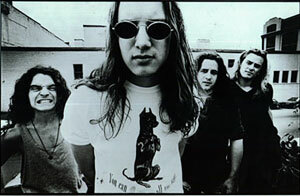 And the world breathes a sigh of relief, as we learn that Candlebox is finally releasing a new album. The World's Lowest Car - Quite an accomplishment. It is always the one you least expect. When I started taking dares to watch movies I knew that I would be confronted with some films that would challenge my patience. I thought that "Urban Menace" would be one of my freebies. "How could it be that bad?" I asked myself. "This was a widely released flick, albeit direct-to-video, with a decent looking premise and video box." Oh, how wrong I was. After three false starts I finally made it through all excruciating 76 minutes. I can't begin to describe just how bad this is. I honestly almost couldn't finish it. My first hint was that it was directed by awful film auteur Albert Pyun (see "Postmortem"), but this was bad by even his oh so low standards. Fat Joe and Big Pun are the villains and seem to adlib the majority of their lines. It is painful to watch Big Pun speak as you can almost see the sound fighting its way up through the 90 lbs. of neck fat. He and Joey Crack come off like their combined IQ would match that of a moderately educated 9 year-old. 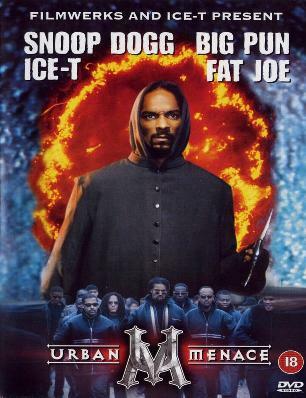 Snoop is the "hero," who has about three lines, that spends the flick killing drug dealers. He employs one angry face throughout. Ice-T gives the most annoying introduction I have ever seen. To top it all off, for no apparent reason, Pyun decided to overexpose the film, so what you get looks like a combination of a home video and an acid trip. The only glimmer of hope in this smorgasbord of pain was an early appearance from Romany Malco aka Jay from "40 Year Old Virgin." That being said, you should avoid this like you would avoid having a rusty hammer taken to your kneecaps. I can say, without hesitation, that this is in the Top 10 of the worst movies that I have ever seen. Well played, Sly Message Board. Well played. Note: If you would like to keep up on the "Let's Make Biff Watch Stuff" debacle, the forum thread is here. Let's get proggy. Do you love Al Di Meola, but always wondered what he would sound like strumming along with a loosely assembled "supergroup"? Well, here you go. This one is all over the place, from the aforementioned prog rock, to some almost disco sounding stuff, to some tracks that bite Parliament hard. Actually makes for a pretty interesting listen. Which would explain why I shelled out upwards of two and a half dollars for this bad boy. you over-rotated - A sweet way to tell someone they tried a bit too hard. Usage - "Dude, my hot date was not so hot." "I showed up at her house with a bouquet of powder blue carnations, the gravity bong I crafted out of a rare three liter bottle of Mountain Dew, and a four pound bag of fun size Kit-Kats. A recipe for a perfect evening. Or so I thought." 06. Everything but the kitchen sync your iPod to this computer? 04. Over the Hill Street Blues was a show that I would describe as a "gritty street drama"